Does the world need another version of Sudoku? Apparently so. Richard Burton made this one. 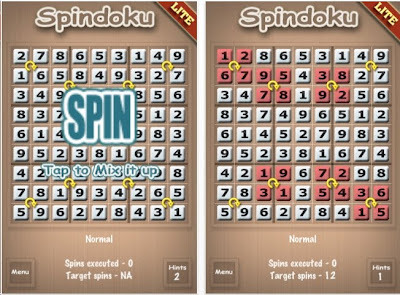 Tap on each of the spinners to rotate those 4 numbers until the entire grid is the solution to a sudoku puzzle. The easy levels have fewer spinners. 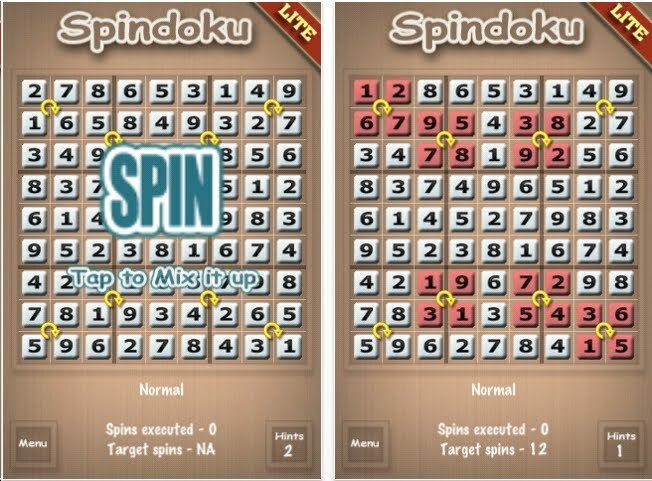 The harder levels have more spinners. Seems like every couple of months, a new robot breaks the record for solving Rubik's Cube. This one is lightning fast. 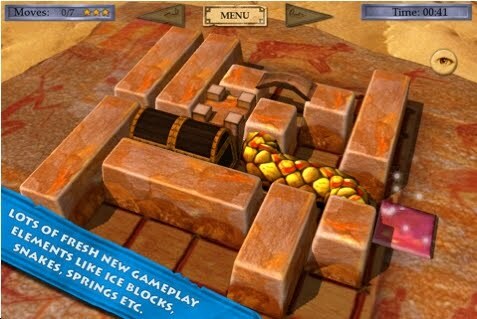 Bobberz is similar to many other free puzzle apps. Try to get 3 adjacent squares or circles together to eliminate them. Swap a blue square with a red square by tapping on them. Look at the image on the left. If the orange bar gets too high, try to lower it by eliminating orange squares and circles. Read the instructions in the image above. 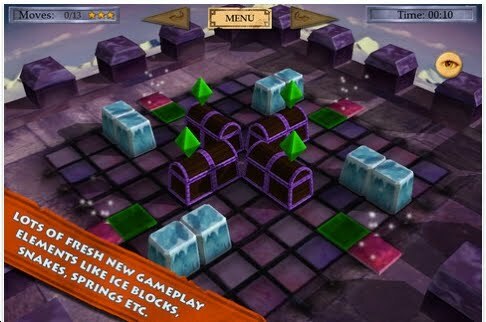 This puzzle app is similar to Floodit and several others. The object is to get all the gears 1 color. 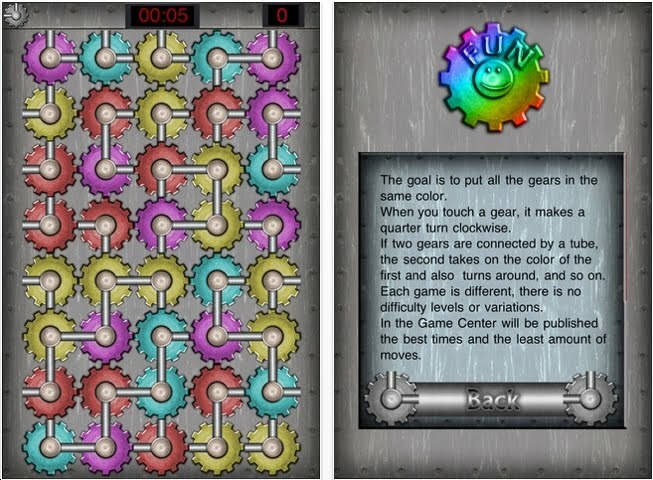 When 2 gears are connected by a pipe then the second gear will be absorbed by the first gear's color and will start a chain reaction. Definitely worth a download, especially because it's free. 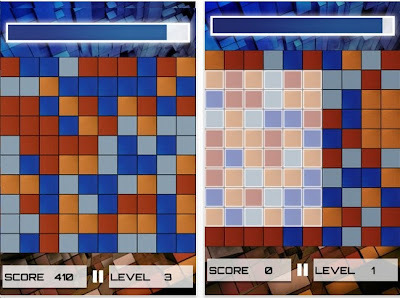 Also: some mathematician out there should investigate this and figure out for any given setup, which is the best color to aim for and what the minimum number of moves is. 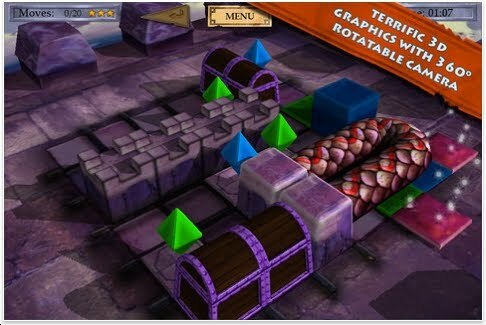 When the puzzle is solved, watch the graphics! The object: you are given a grid of numbers, or pips. Place the dominos at the bottom on the grid to match them. I first saw this type of puzzle in the Dell Math & Logic puzzle magazine, maybe 20 years ago. They're fun! 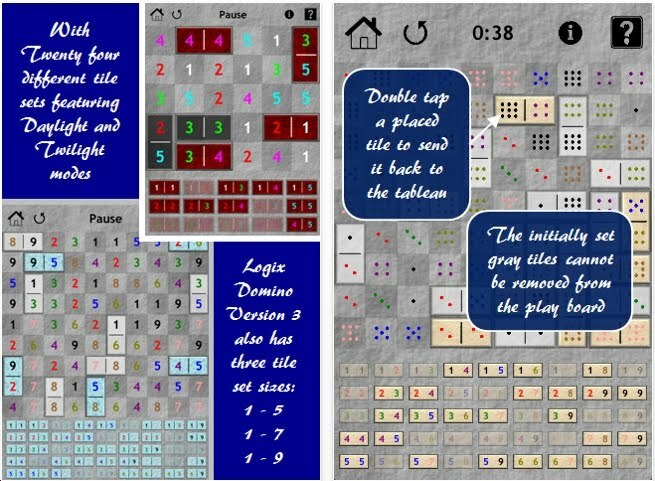 In Logix Domino, the user interface is quite good. I just bought a copy of JiGaZo at Amazon.com by a seller called Blessedbybooks for $7.88. JiGaZo is a totally cool mosaic jigsaw puzzle to create images of anything. 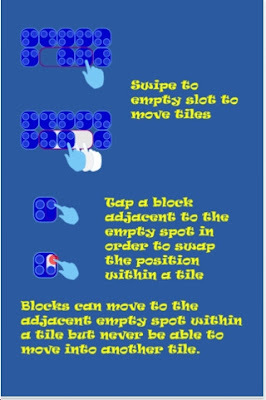 I downloaded Blluby Arcade and tried to figure out the rules. The rules are not posted on the app itself. However, I went to the company's webpage: http://site.crazyminds.net/ and still am lost about the objective. Can you make sense of this? 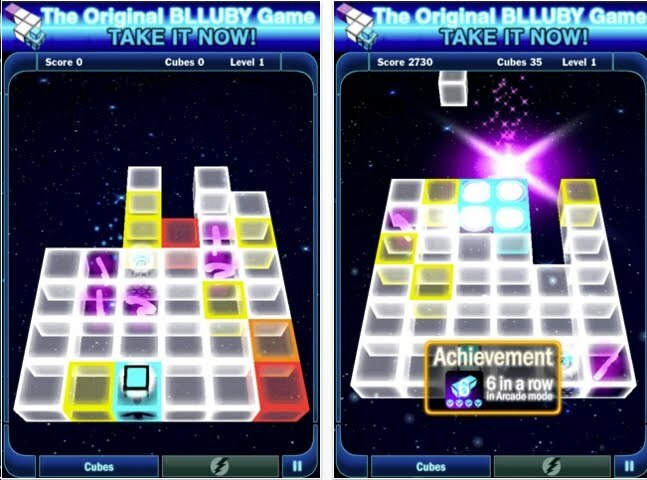 "BLLUBY Arcade is a FREE puzzle game in an arcade style. It uses the mechanics of the BLLUBY Game - the same rules of how can you walking above the colored cubes and how can you turn them in the blue color. But now, you need to make rolls, of at least 4 cubes, to destroy and eliminate them of the game. If all the 6 columns and 7 lines contains cubes, you lost. Each move a new cube falls from the top, take care you do not be locked by dead cubes( blue cubes ). - "Remember of the rules! BLLUBY Game rules!" BLLUBY Arcade has 3 game modes, Arcade, Portals and Vegas. 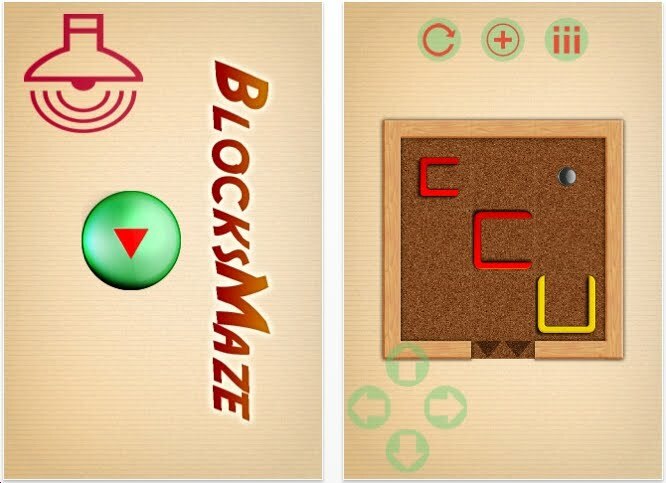 Each game mode has a new and totally diferente challenge..."
Move the small red block into the large red block and then exit the maze. I really want to like this puzzle app, however, the arrow key controls just don't work very well. There are 5 free levels. 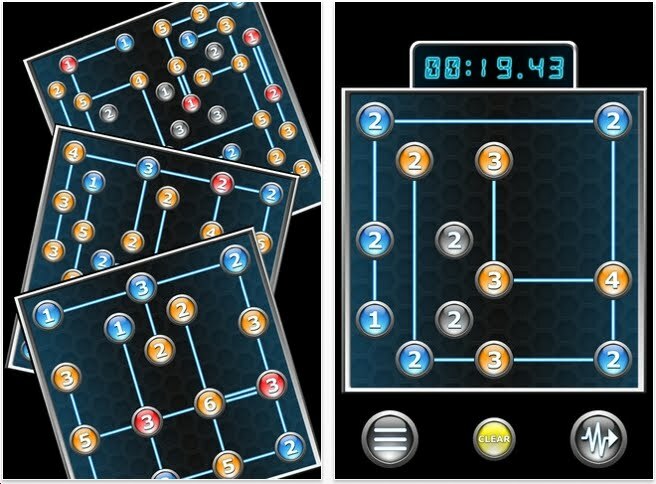 I'm keeping this puzzle app on my device in the hopes that the controls will be fixed. Quares is a free puzzle app for the iphone, ipad and ipod touch. 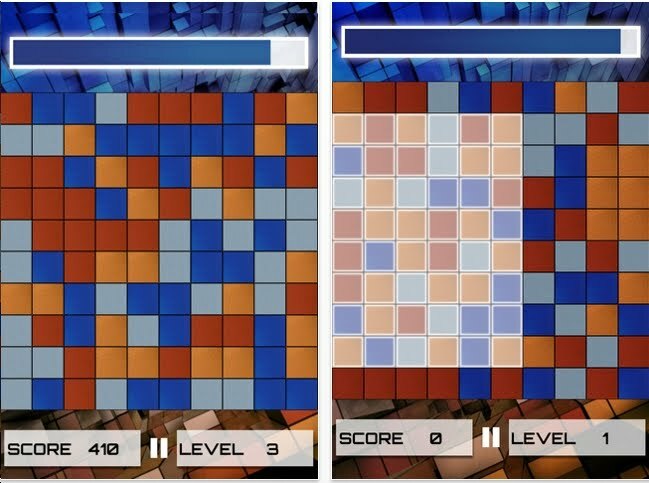 Find 4 corners of the same color within the grid and score points. The bigger the rectangle, the more points. You are being timed! Every time you tap a square, you gain time. We've seen puzzles identical to this. Still, it's fun! So download it! Power Grid comes from PufferFish Games Ltd. Each Power Grid Circle has a number which means that it is connected that many times to other circles. Grid sizes are 7x7 and 9x9. The full version has 11x11. Years ago, I bought a book from Nikoli Press in Japan that has these puzzles. Without a doubt, it's annoying to have to erase lines, so the touch screen makes this more fun. 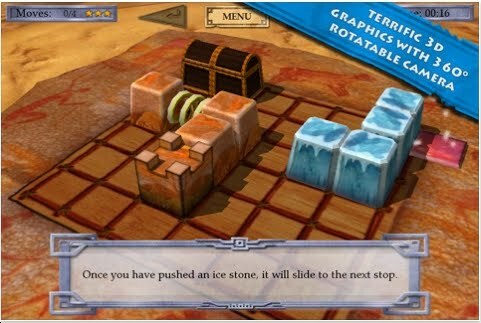 Word Seven is a point-scoring puzzle. Spell words from the list of letters. The longer the word, the more points. 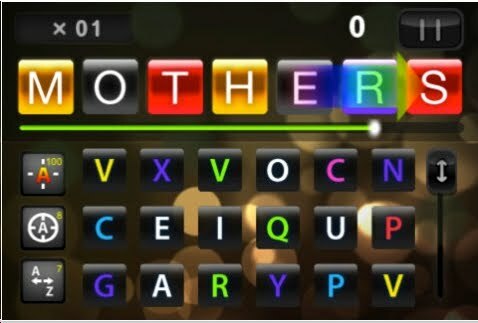 All letters are colored - use different colors for your word to score more points. The objective of On Tilt is to get your yellow smiley onto the star. You do this by tilting your device in various directions. 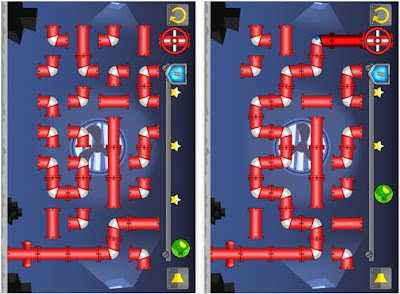 We've seen lots of tilt mazes where all the pieces travel until they hit a wall. This one is okay, however, I would prefer that the user be able to swipe the direction instead of tilting. For example, if you're hold the device upward, that automatically dictates the first move, which potentially could lead to a dead end. Peter Livesy, the developer, told me that he intends to add the swipe feature soon. If you like On Tilt, you will also like: Blockhouse and Boxat. This summer I played all the levels of Blockado Desert. It's free until this Tuesday. I highly recommend the entire Blocado series: Blockado Jungle, Blockado Desert, Blockado Mountain and very soon to be released: Blockado Deep Sea. 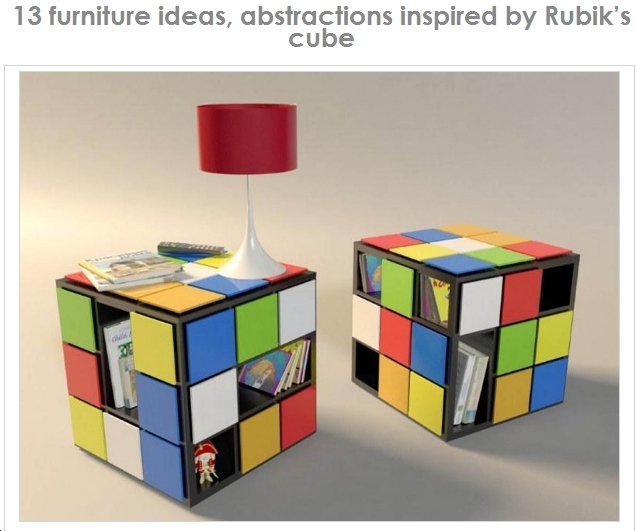 Click here to see more Rubik's Cube Furniture ideas. We've seen numerous puzzle apps like Rotatoland. The object is to arrange the tiles in the correct numerical order by sliding the rows and columns. 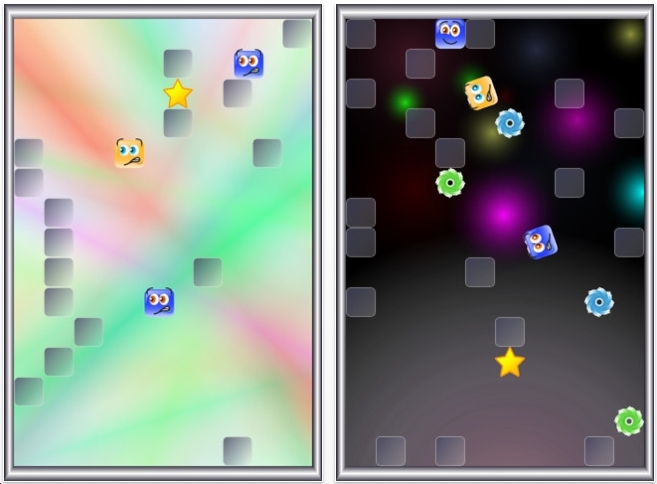 However, in the second level of puzzles, tapping on one tile rotates the surrounding tiles in a clockwise order. That's easy to imagine if the tile is in the middle. Can you figure out what happens when a tile on the edge is tapped. This level is HARD! 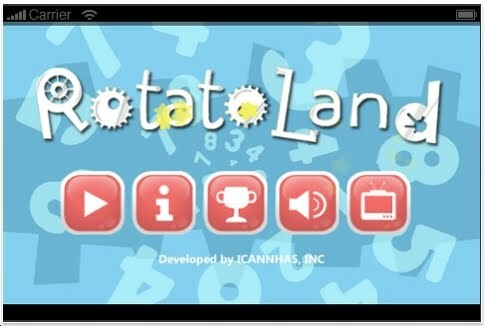 Rotatoland is not the best free puzzle app, but it's darn good. Steve Jobs will be remembered for many things. I doubt that he will be remembered as a Puzzler. His invention of the ipod touch, the iphone and the ipad led the invention of the App Store. The App Store opened the creativity of thousands of puzzlers around the world to bring their ideas to everybody. 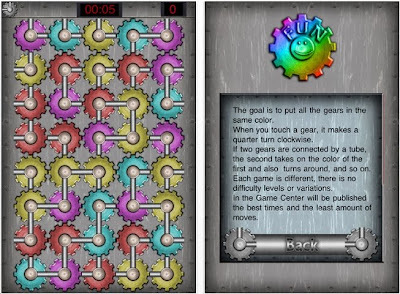 Every week, there are approximately 150 new puzzle apps released on the app store. Most are not interesting. However, a few are always quite good. Without the App Store......it would not have happened. The New York Times has a Wordplay blog. 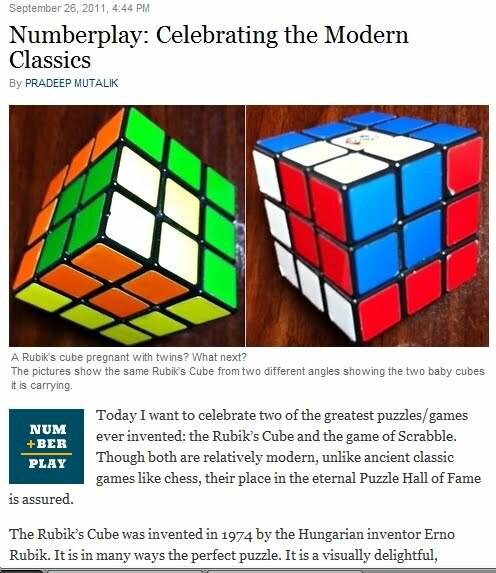 Nice little blurb about Rubik's Cube. 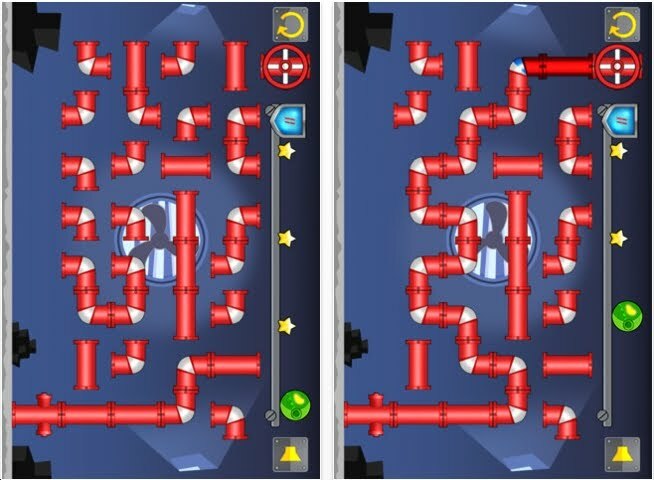 Plumber Game consists of 50 puzzle levels. The object is to connect the water source to the hydrant by rotating each of the straight and curvy pipes. I have solved all 50 levels. I thought I would do 5 or 6 levels, but I couldn't stop! It took about 45 minutes to complete them all. Is Plumber Game one of the best free puzzles apps? No. But it's definitely fun. 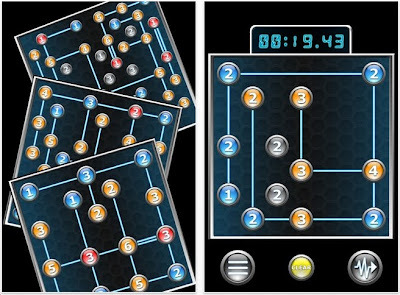 Sh!ft is a puzzle where you have a time limit and must score as many points as possible. To score points, 3 or more eggs must line up vertically, horizontally or diagonally. You may shift entire baskets to an empty space. 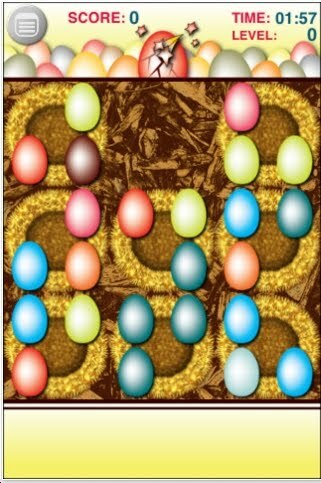 Also, within each basket, eggs can be moved from corner to corner. Sh!ft has a nice user interface and is a good free puzzle app.